Very sassy! Black patent high heel sandals featuring a 5½in silver chrome stiletto heel. The are 3 narrow cross straps at the foot, a double ankle strap with buckle fastening and closed back heel. Made by Pleaser USA - well-constructed footwear on the edge of fashion. Only 1 size remaining! Please see our Product Description below for full details and important sizing information. 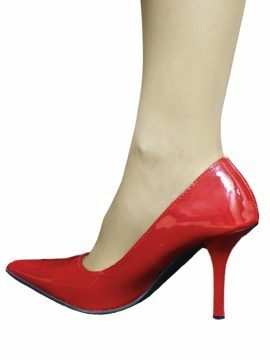 Stylish French heel vintage shoes in the Bordello range by PleaserUSA. 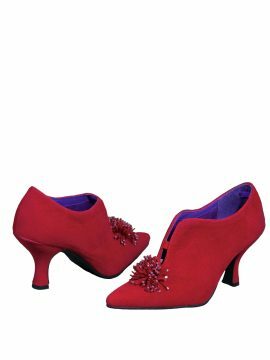 They are made in red microfibre/faux velvet material and have a 3in French heel and a pointed toe with rhinestone pom pom. 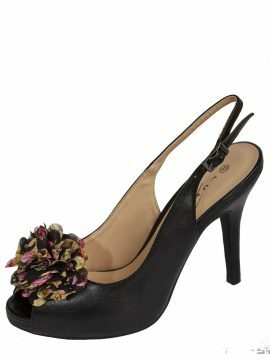 These shoes will look good in outfits with a long skirt, including vintage, Victorian or burlesque styles. Please see our Product Description below for full details and important sizing information. 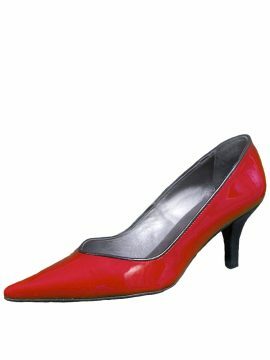 Stylish and vampish Pleaser stiletto heels in red patent with a pointed toe. 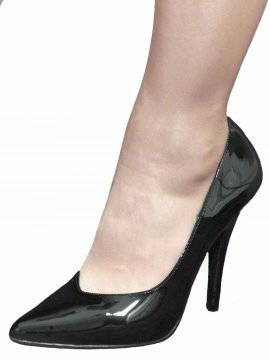 A classic style with a comfortable height 3.75in stiletto high heel. Good quality and construction from Pleaser USA. Please see our Product Description for full details and important sizing information.